The 2019 Mazda3 just had its debut at the 2018 Los Angeles Auto Show. A ton of new information released with this grand reveal, but we’d like to focus on the new engine options for the redesigned 2019 Mazda3. While the 2018 Mazda3 has 2 engine options, the 2019 Mazda3 will release with 5! Before we get into the engine options, let’s very quickly go over the transmission options. Depending on your choice of ride, you can control your new 2019 Mazda3 with a 6-speed SKYACTIV®-MT manual transmission or a 6-speed SKYACTIV®-Drive automatic transmission. First off, we have the returning SKYACTIV®-G engines. However, now there are 3 engine options. The 2018 Mazda3 came with a 2L inline 4 engine with a 2.5L inline 4 engine upgrade available on the Touring and Grand Touring trim levels. 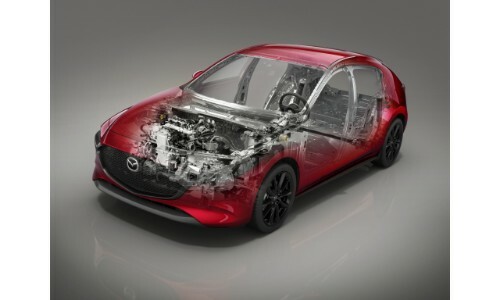 Now, there are 1.5L, 2L, and 2.5L inline 4 engine options of the SKYACTIV®-G Mazda engine. Currently, it is unclear if the 1.5L or 2L engine is the baseline inclusion. Next up, we have the new diesel engine option for the 2019 Mazda3. Although specs are not yet released, this SKYACTIV®-D 1.8L engine is expected to greatly increase responsiveness, efficiency, and performance for a much smoother and controlled ride. Lastly, we have the big ticket of the lot. That would be the revolutionary SKYACTIV®-X engine that is finally, nearly here after years of anticipation. The SKYACTIV®-X engine uses spark-controlled compression ignition that provides far more efficiency compared to the previous SKYACTIV®-G engine, putting it more in line with a diesel engine option. In addition to fuel efficiency, the SKYACTIV®-X is expected to provide a dramatic jump in terms of driving dynamics, hoping to match or exceed the thrilling experience of the Mazda6. You can expect additional information about the 2019 Mazda3, such as pricing information, to follow as we near the spring 2019 release of the 2019 Mazda3. If you have additional questions on the subject, please contact us here at Marketplace Mazda. Our staff can be contacted online, by phone, or in person. The Marketplace Mazda dealership is located in Rochester, New York within Monroe County. This entry was posted on Wednesday, November 28th, 2018 at 4:59 pm	and is filed under Mazda3, Technology. You can follow any responses to this entry through the RSS 2.0 feed. You can skip to the end and leave a response. Pinging is currently not allowed.